This design is from the JDR-BE websites: Beginners BE start kit. I duplicated several flowers into the design to fill it out a bit more. My finished size is about 8 inch square. 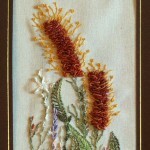 Brazilian embroidery Edmar kit of the rusty color Grevillea plant. This Grevillea plant is part of the Edmar BE Primavera design. 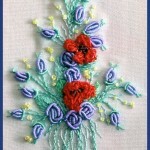 Worked in EdMar rayon threads, the stitched area is approximately 2.5 inch x 4.7 inch. 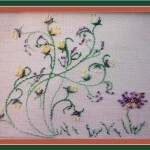 I am stitching my way through five of the BE beginners kits from the jdr-be.com website. Learning a lot. 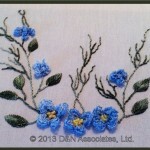 My bullion stitches are greatly improving, so is my stem stitching. 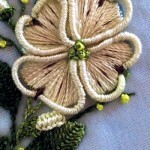 This is my second group of Brazilian Embroidery stitches that I learned. 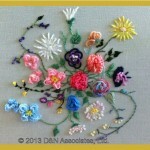 I purchased the kit from JDR-BE website. 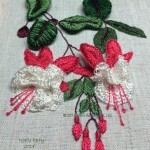 Designer is Loretta Holzberger, design is called Swingtime and is fuchsia flowers, leaves and a butterfly (which I still need to stitch and add to the worked piece). I purchased the kit from her website. The design is called Sharon’s Yosemite Dogwood. The design is a 2.5 x 3.5 inch oval and pre-printed on ivory trigger cloth. 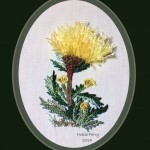 This is a Brazilian embroidery Edmar kit of a yellow cornflower plant. This yellow cornflower is part of the Edmar BE Primavera design.